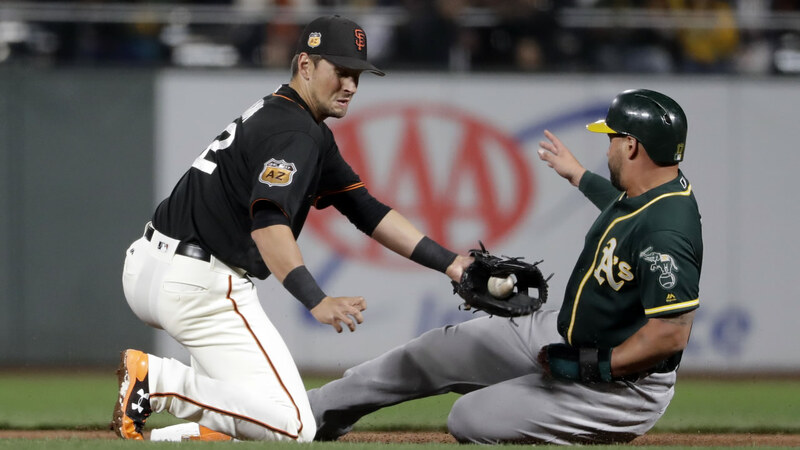 OAKLAND, Calif. -- Not much is going right for the Oakland Athletics or the San Francisco Giants this season. The A's are buried in last place in the American League West, while the Giants dwell in the cellar of the National League West. That doesn't mean A's manager Bob Melvin is any less excited about the upcoming four-game, home-and-home interleague series between Oakland and San Francisco, which opens Monday night at the Oakland Coliseum. As a Bay Area native who played three years for the San Francisco Giants and has managed the A's for seven seasons, Melvin loves the annual Bay Bridge Series. "I'm lucky enough to be in this multiple times, and you don't know how long you're going to be able to be part of this," Melvin said Sunday. "And when you grow up here, these four days, the whole baseball world, at least baseball fans in this area, the spotlight is on that. "Both teams aren't doing too terribly well this year, but that changes for this series because it's a passionate fan base here in the Bay Area. They love both their teams and it is always spirited, not only in the field but in the stands. So it takes on a little different dynamic than the other games we play during the course of the season." A's rookie third baseman Matt Chapman grew up in Southern California watching the Angels and Dodgers play their annual interleague series. This will be his first regular-season taste of the A's-Giants rivalry. "It's definitely always a heated battle between (the Angels and Dodgers), kind of just like the Bay series with the Giants and A's, kind of fighting for the home turf in a sense," he said. "For me I'm just looking forward to kind of seeing the atmosphere. "I think Southern California is a little more laid back with their sports. There's a rivalry there, but the one up here is definitely a little more intense." Sonny Gray (6-5, 3.43 ERA) was the A's listed starter for Monday's game, but the former All-Star right-hander was dealt to the New York Yankees before Monday's non-waiver trade deadline for outfielder Dustin Fowler, right-hander James Kaprielian and infielder/outfielder Jorge Mateo. Rookie Paul Blackburn (1-1, 2.25 ERA), a Bay Area native born in Antioch, Calif., will make the start following Gray's departure. Veteran Matt Cain (3-9, 5.45 ERA) is slated to make his 20th start and 21st appearance of the season for the Giants. Cain is no stranger to the Bay Area baseball rivalry. He is 4-5 with a 2.34 ERA in 12 games, including 11 starts, against the A's. In six games, including five starts, at the Coliseum, he is 1-2 with a 1.60 ERA. In his most recent start, on July 24 at AT&T Park, he gave up six runs, but only two earned, on six hits over four innings in a 10-3 loss to the Pittsburgh Pirates. He struck out one, walked one and gave up a three-run homer to Andrew McCutchen in the second inning. Cain has lost eight straight decisions, matching his career high. The A's will come into the game with some momentum after back-to-back walk-off wins against the Minnesota Twins at the Coliseum. Rajai Davis hit a two-run, game-ending homer in the ninth inning Saturday in a 5-4 victory, and Yonder Alonso hit a solo homer in the 12th inning Sunday to produce a 6-5 win. The Giants were swept three games by the Dodgers, who managed a 3-2, 11-inning walk-off win Sunday night in Los Angeles. Pinch hitter Kyle Farmer, making his major league debut, hit a two-run double down the right field line off Giants right-hander Albert Suarez to end it. San Francisco wasted a gem by Madison Bumgarner, who pitched seven shutout innings. "So many good things happened tonight, which is what makes it so tough," Giants manager Bruce Bochy said. "This team really fought. It is unbelievable the way things have gone for us. We play hard and to lose like this. "Guy in his first major league at-bat hits it down the line. Everything goes right for the Dodgers and everything goes bad for us."